iMusic is a great tool to share songs between iPhone/iPod/iPad with Android phones. Here are the steps for how to transfer music from iPhone/iPod/iPad to Android phones. Connect both your Apple device and Android phone with your computer via digital cables. After then, install and launch iMusic. The software will detect the 2 connected device automatically, displaying them in “DEVICE” management window. Click “DEVICE” on the top of the software. You can see there is a device icon in the left side. Click it to choose the Apple device. By doing this, the Apple device will be displayed there. If the Apple device does not appear, you need to tap “Trust” in the “Trust This Computer” option on the Apple device. 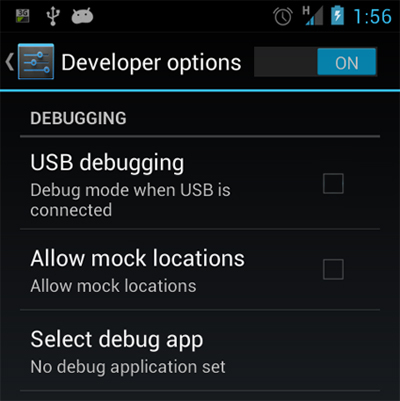 If the Android device does not appear, check the option “USB Debugging” in the Settings menu on the phone. Option 1. 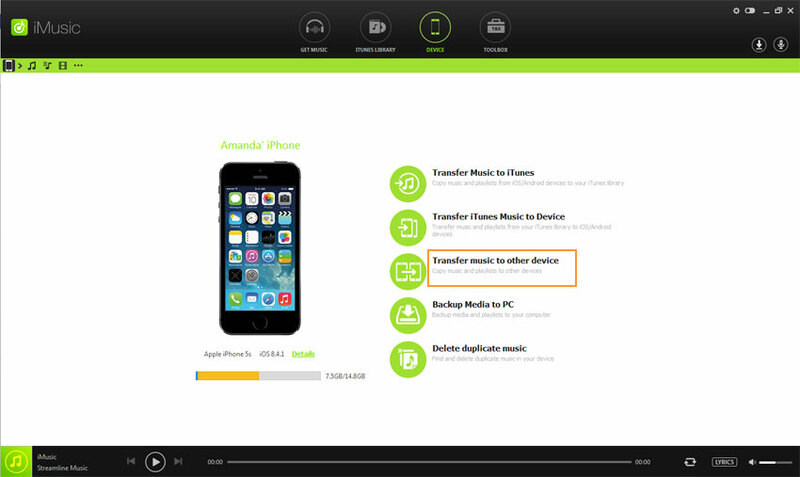 1-click to transfer all music from iPhone/iPod/iPad to Android phone: click “Copy Music to Other Device” in the “DEVICE” management window > choose the Android device name. 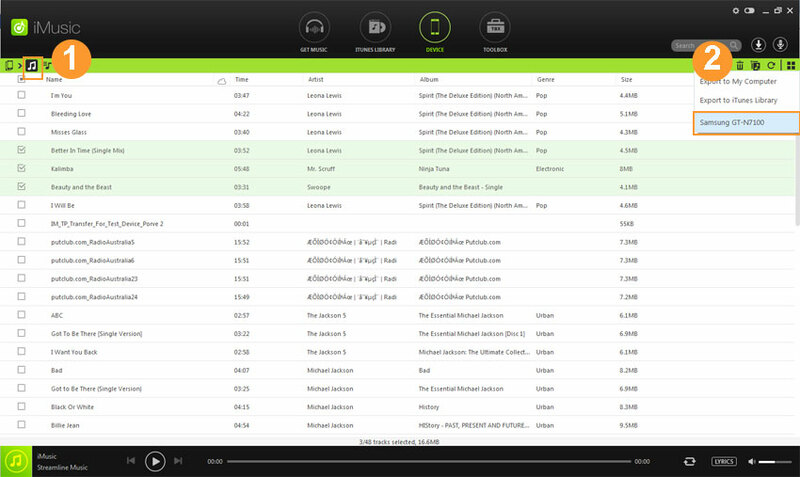 In a few seconds, you can see the songs on your Android phone. Option 2. Transfer songs from iPhone/iPod/iPad selectively: click the music icon, the 2nd icon to show all songs on the Apple device. 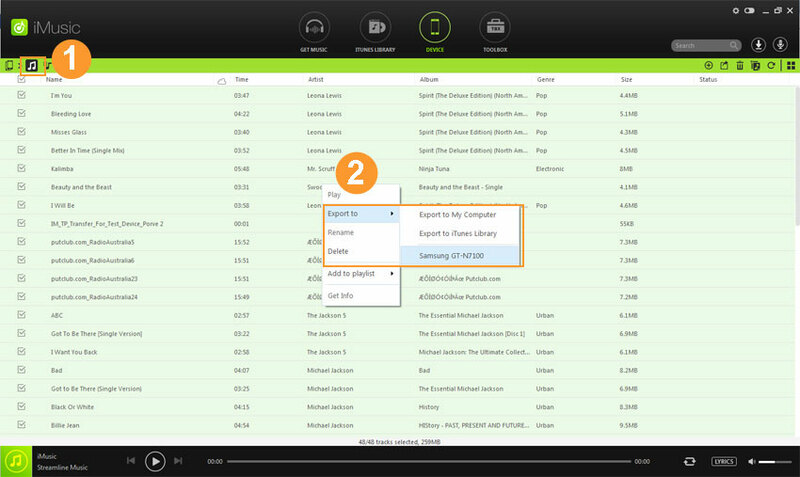 Next, check needed songs > then, click the export icon on the right side > click to select the Android device. You can also right-click on the window after you check the needed songs, then choose “Export to” and click your device name.